Ty Houghtaling understands “church league” programs have a bit of a bad rap in sports circles. With focus on both the physical and the spiritual, many people tend to picture the teams gathering to sing “Kumbaya” after the game and coaches intervening during it to make sure things don’t get too competitive. But that’s a stereotype Houghtaling is working to break as league director of Seek 1st Sports, a youth football and basketball league based out of First Baptist Church. “The idea is that sports are great, we ought to celebrate, we ought to work hard, but it’s not the highest priority in life,” Houghtaling says. “That there can be a good balance between the fun, the competition, and the development of youth sports and our spiritual needs as families. Seek 1st was born of Houghtaling’s desire to create a church-based youth league with a strong focus on the sport. As a former athlete and coach in the Artesia Public Schools system, he saw areas of the city’s former church league – Upward – that could be improved. The program is structured differently than most traditional youth leagues. One Monday-night practice is held each week of the season, during which all participating athletes gather. “It’s not that different from what you would see at high school,” said Houghtaling. “If you think about the baseball team, the whole team – JV and varsity – are together at the start before they divide up. If you drive by the baseball park, you’ll see some kids in the cage, some kids on the infield taking ground balls, some kids in the outfield taking fly balls, but they’re all one team – the Artesia Bulldogs. Rather than scheduling individual games each week throughout the season, the program holds its competitions in a tournament format on the final three Saturdays of the season. “It kind of has a Hike It & Spike It feel to it, but there’s no down time, no having to sit around and wait two hours for your next game,” says Houghtaling. “We just play, back to back. The kids play hard, they get tired, but it’s been very successful so far. Part of the reason Seek 1st uses that unique schedule is to make participation easier on families. “We don’t play midweek games,” Houghtaling says. “I know parents want their kids to be involved, and some parents have their kids participating in multiple things, so running around to practices and games can be stressful. 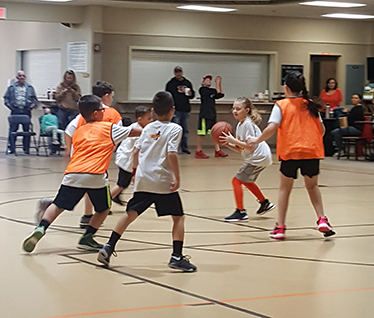 Seek 1st is open to youth in grades K-5 and recently wrapped up a basketball season that saw around 100 children participating. The K-1 group competes in fundamental contests rather than games, consisting of dribbling competitions, relays, and shooting contests. 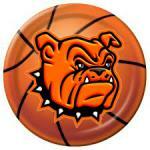 Grades 2-3 compete three-on-three on a short court, and grades 4-5 use the full court, four-on-four. He stresses, however, that everything else about the competition is game-format. “We call travels, carries, fouls, we substitute at buzzers, we keep score, you can pressure your guy in the backcourt, and if you can steal the ball and go score, steal it and go score,” Houghtaling says. “If a team wins 62-0, it’s 62-0 and that’s what happened. We’re not going to shy away from the competition aspect. That’s the sort of competitive nature Houghtaling developed as a Bulldog, and as a former APS coach, he also teaches young athletes according to what they’ll see as they advance through the school programs. “We spend a lot of time on foundation fundamental skills at our practices,” he says. “We do the things the Artesia way, and I have experience in that. I know what Coach (Rex) Henderson is doing at the high school, I know what Coach (Michael) Mondragon and Coach (Jeff) Houghtaling are doing with their basketball programs, so I can use their same terminology and language, because I know what it is. Seek 1st has additionally benefited over the years from coaches who were also formerly with the APS, but Houghtaling says even novice coaches improve quickly due to the way the league is structured. Seek 1st currently only consists of football and basketball, with the next football season anticipated to start in July and culminate by the end of September. Houghtaling says he hopes at some point to be able to add volleyball to the league, as well. As for now, however, he plans to continue growing Seek 1st Sports and contributing to both the spiritual and healthy competition needs of Artesia’s youth. “People who’ve tried it, they see what we’re trying to do,” he says. “Some have stuck with us, some haven’t, and that’s people’s prerogative. But I think everybody who’s tried it knows we teach good foundation fundamental skills and we give kids room to thrive.